If you believe in the change we helped initiate this years, I encourage you to support Sergey for W3C Technical Architecture Group – here is why. But you are probably weary of hearing about W3C Elections. I get it. To be honest, I am a bit weary myself. We’ve done a lot in a very short time and it can begin to seem like it will never end. But, in fact, it will end very soon: Midnight tomorrow to be exact (Tues, July 16th 2003). Whether you do anything or not, when you wake up on Weds, it will be over. If you are an AC rep – just vote. If you know an AC rep, send them an email. If you are just a regular Joe or Jane developer – state your support on Google+, Twitter, Facebook or wherever – you’d be surprised how connected we all are and how likely it is that someone who might help could see it. In the very least this helps show popular support, which is relevant no matter who wins. For the unfamilliar, the W3C Technical Architecture Group is a kind of steering commitee for the direction of the Web and its architecture and how that relates to Web Standards. It is composed of 9 members chaired by Sir Tim Berners-Lee , a few appointees and 5 elected members. Since its inception, this has been a closed process and, although it maintained a public mailing list, the simple fact is that few people were even aware of it. How could such an important group be largely unknown? Surely we should be well-aware of its works, right? As it turns out, not really – but we have felt effects. What’s more, only a small percentage of eligible representatives even cast their vote in these elections. This year we changed that by taking the case to the public that we would like to change all that. We got reform candidates to blog about their vision: what they would envision and advocate and where they thought TAG and W3C itself needed some improvement. We tweeted and blogged and shared and made public opinion clear and lobbied representatives to exercise their right and vote with us. What resulted was the most participatory election in W3C history and every open seat filled by one of our candidates. In the few months since then, things have shaped up nicely. We have seen great advice on improving APIs and coordination across Working Groups. Excellent new things like Promises/Futures being introduced across the spectrum. TAG, as a group, is more known and visible than ever: things are moving to github, you can follow it on Twitter, they have even had a Meet the TAG event. TAG members are out there in public – developers know who they are, they know the sorts of things they stand for and they are interested. All 4 of our candidates and both new TAG co-chairs helped author and/or signed the Extensible Web Manifesto, laying out a new, more open vision for architecture and process surrounding standards. Work to replace WebIDL in standards descriptions has begun. When it was time for Tim Berners-Lee to appoint a co-chair, he appointed from among our reformers (we had more candidates than seats available). But another thing happened, one of our elected representatives switched employers and because this would leave the TAG with two members from the same organization, it means he is no longer eligible to serve. As such, there is a special election happening to fill his spot. There are only two nominees to fill this seat: Frederick Hirsch from Nokia and Sergey Konstantinov from Yandex. Frederick is a pretty traditional sort of TAG nominee – he has lots of W3C experience under his belt and credential projects like XKMS, SAML, WS-I Security and a bunch of other stuff. Sergey is pretty new to the official Web Standards game – Yandex has only been a member of W3C for about a year. 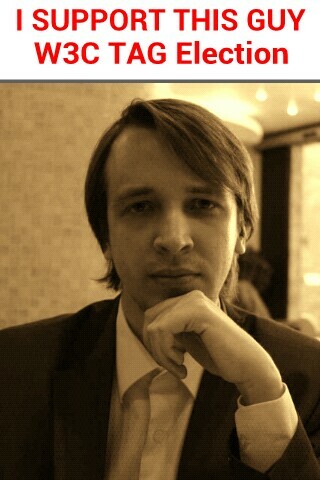 He comes from the trenches – most recently in charge of Yandex Maps. He does a lot of working with developers directly, he has written two public posts explaining some of the reasons that he is running. I have spoken to him myself and I believe that electing him will reaffirm the mandate that we sent at the beginning of the year.